When it comes to your inks in Canada, buy the compatible HP 60XL ink cartridge combination and not only save your money, get the highest quality inks available. Quality ink can really make a difference when you are printing your documents or photos. Generic ink will make your prints come out with a very bland or with low quality. 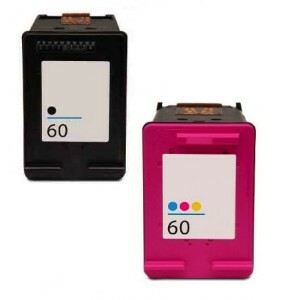 When you use a quality ink product, such as what is inside our compatible for HP 60XL ink cartridges, you will find that your prints are jumping off the paper almost. With all orders made online on Absolute Toner, you will Earn Rewards Points which can be used to save even more money on your HP InkJet printers. Shopping online for the Best Price on HP 60XL Ink Cartridges in Canada, Right Here! Our compatible HP 60XL black ink and compatible HP 60XL colour ink cartridges will make you happy with the money that you are saving. Saving money without losing the quality is something that many of us would really like, and that is what you will get from Absolute Toner. On Absolute Toner We Will Beat Any Price! We stand by that, and you will get the highest quality for the lowest price.